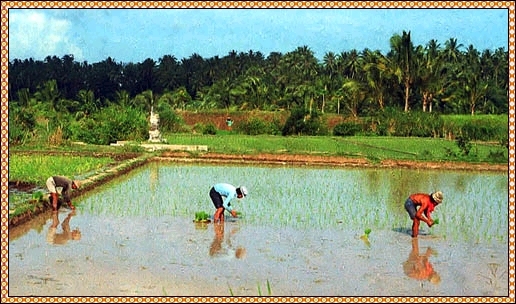 During 1981 my wife and I travelled to Asia for the very first time. 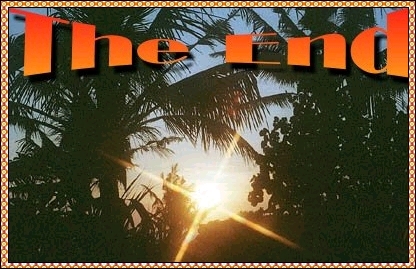 After travelling through western- and middle parts of Java, we continued to Bali. 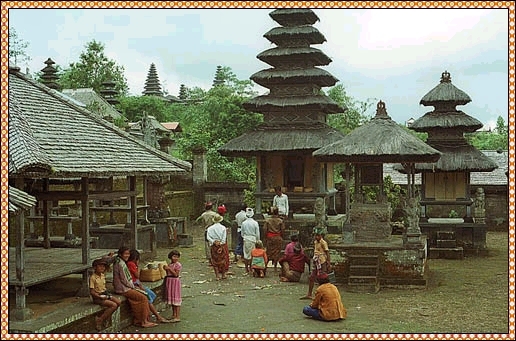 The idea was to relax and "recover" from the travels on Java, but the richness in temples and history took us again to many temples and sights. 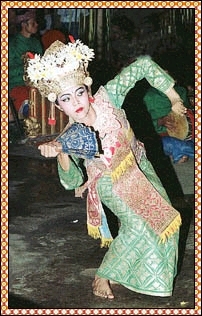 Compared to Java, we found the music on Bali more pleasing and accessable, in terms of rhythm. As with these performers of the "Legong Dance" (left and middle) and "Barong Dance" (right) , we found life at Bali more colourful and people demonstrating a clear zest for life and fun. 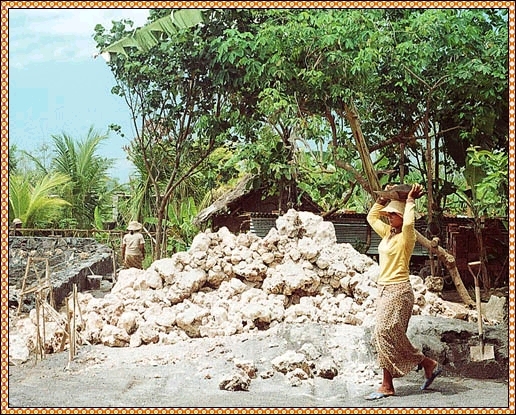 We found many women involved in hard physical labour: building a house (above) and producing stones and rocks it seems, in the river (perhaps involved in the roadworks going on nearby). Offering plays a significant role in Balinese life as they appease the spirits and thus bring prosperity and good health to the family. 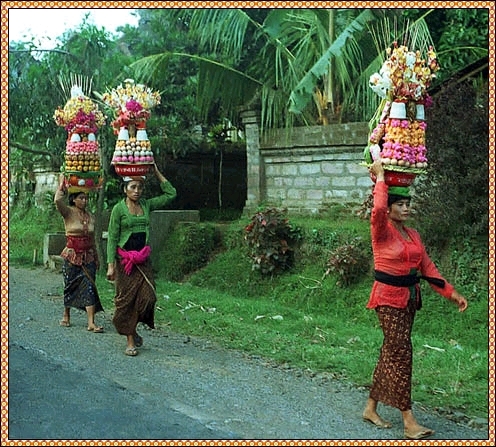 Every day little offering trays (canang sari) containing symbolic food, flowers, cigarettes and money, are placed on shrines, in temples, outside houses and shops, and even at dangerous crossroads. 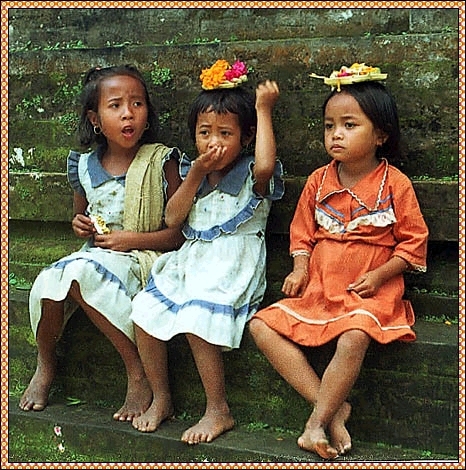 Although the Balinese are Hindu, their religion is very different from that of the Indian variety. They do have a caste system, but there are no untouchables and occupation is not governed by caste. 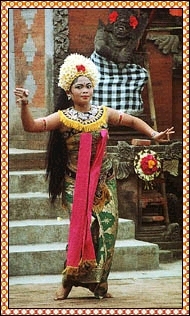 Although the Balinese worship the Hindu trinity Brahma, Shiva and Vishnu, these are seen as manifestations of the Supreme God Sanghyang Widhi. 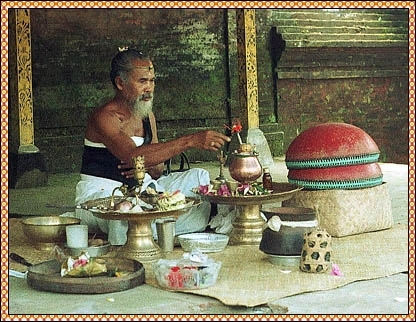 Other Indian gods like Ganesha (the elephant-headed god) often appear, but, more commonly, one will see shrines to the many gods and spirits that are uniquely Balinese. 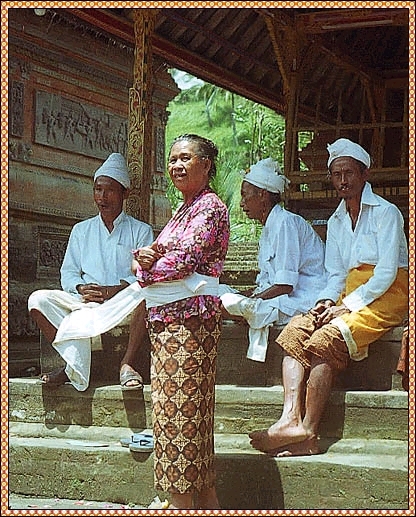 The Balinese believe the island is owned by the God Sanghyang Widhi and the Balinese are merely the tenants. 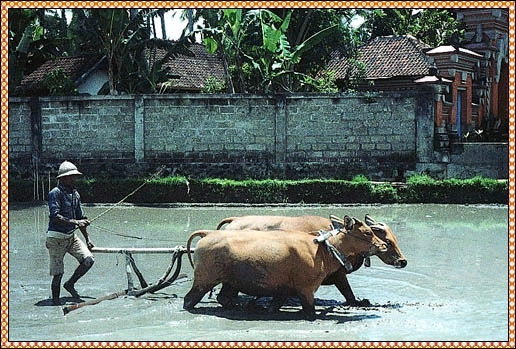 And thus spend most of their time in acts of reverence (there are over 60 religious festivals on Bali each year). While the temples with their rich decorations offer many photo opportunities, I found I liked photos like these the best. 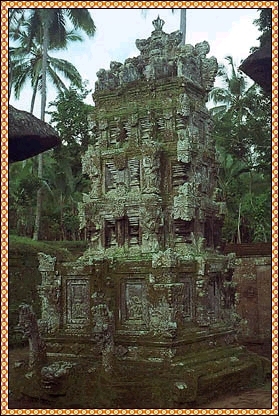 Temples can be found left and right, they are everywhere: there are some 20.000 on this island and can be found on marketsquares, rice paddies, backyards, isolated hilltops, crossroads, etc. The temples sometimes look new, others look ancient. 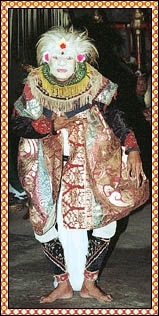 But they are all richly decorated. Like I said, I love to photograph the people. The people were very friendly and kind, in a content way. Out of respect I tried to do my photography as inconspicuous as possible. These girls lost their innocence for tourists a long time ago: they demanded money after they noticed I had taken a photograph of them ! They stood around me, yelling "money, money", and I felt embarrassed and did not know what to do: ignore them (but I could afford giving some) or pay them (but how much ?). I reacted against the pressure for payment by ignoring them and walking away, but I made a note to be extra cautious while photographing children ! They do make a pretty picture, don't they ? 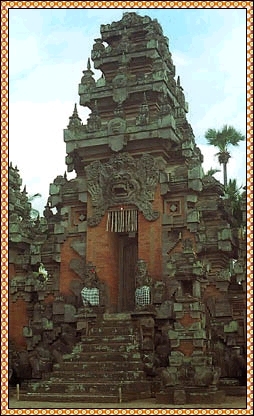 The "Besakih" temple is located some 60 kilometers north of Denpasar, dates from the 11th century (pre-Hindu) and is a very large complex. It is very picturesque and impressive. 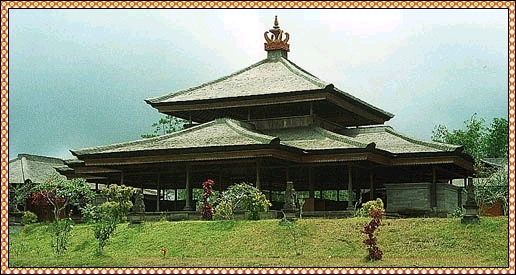 The temple is located against a volcano, the Gunung Agung. This volcano erupted in 1963 for the last time: a quarter of Bali was covered in lava, 1600 people died and 8600 lost their homes. This eruption took place during the festival "Eka Dasa Rudra" which only once in a 100 years takes place and before 1963 the last eruption dated from... 1350 AD !